Posted on Fri, Mar 23, 2012 : 8:30 a.m.
My son Jeremy, his best friend Mitch and Stuart (my ex-husband, for those who don't remember that we're actually capable of associating with each other civilly!) went out for an early dinner recently to Aubree's in Depot Town, today's Frugal Floozie Friday feature. Jeremy chose the location, as he was craving a reuben — his favorite sandwich — and he knew that this restaurant makes a very good one. Stuart was feeling particularly agreeable that afternoon, so he offered to just split whatever I ordered. And I was in the mood for something substantial. I considered a variety of items, and heeded Jeremy's warning not to order salad (he grows weary of watching me do that, but I love salads!). And so I settled upon a calzone, which would come in at under $5 per person — our mandatory Frugal Floozie Friday budget — when split with Stuart. 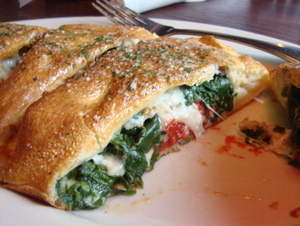 The calzone was huge and could have fed four with no trouble. The portions were significant. This was, after all, a 12-inch pizza folded over and filled with sauce, a blend of five cheeses, and two toppings of our choice — spinach and mushrooms. Even a hearty eater could be satisfied with one slice. Mitch and Jeremy each ordered a Reuben, which was generously portioned and tender. It was served with the customer's choice of side dish: thin-cut fries, sweet potato chips, onion straws, cole slaw, cottage cheese or — the one both chose — the endless steak fries. For $8.99, this is a stellar deal! And the platter can easily be shared by two. We also ordered dessert ... well, why not? Each offering costs $4.99, so it's either a great Frugal Floozie Friday treat for one or an even greater value if shared. Jeremy and Mitch split the Rockside Brownie Bites, described as "Rich brownie bites topped with caramel, toasted pecans & chocolate ganache dipped in a fluffy batter & fried crisp. Served with vanilla ice cream & chocolate & caramel drizzle." It was obscenely decadent and absolutely delicious! Stuart and I shared the Cookie Crisp: "Creamy chocolate chip cookie dough rolled in a flour tortilla and fried," which was also served with ice cream and the sweet, seductive sugary drizzles. Neither dessert offered any redeeming nutritional value, but both were simply good for our souls. When our very friendly waitress left the bill, we thought there had been a mistake made; the calzone was listed at $4.99 rather than the $9.99 I'd seen on the menu. But when I asked about the discrepancy, I received some fabulous and completely unexpected news: during Happy Hour, from 3-6 p.m., the calzones are half-price! So the entire enormous, delicious array of crust and cheese and sauce and fillings qualified as a Frugal Floozie Friday bonanza without any need for an accomplice to split the cost! Shared by four hungry eaters, it would come in at only $1.25 per person! Needless to say, Aubree's offers great value, friendly service, and lots of frugal dishes to choose from. Enjoy! Sun, Mar 25, 2012 : 1:38 a.m.